U.S. consumers, by and large, like their food salty. As a result, the amount of sodium in the average U.S diet has drifted higher, to dangerous levels, over the last three decades, according to the Centers for Disease Control (CDC). Knowing this, policymakers and public health officials are considering both public education campaigns and the possibility of legislation to address the problem. But to do this effectively, they need good information, not only about the amount of sodium consumed, which the CDC monitors, but also about consumer knowledge and attitudes. A new study by marketing researchers at the University of Arkansas shows that American consumers ignore the amount sodium they eat, even though excessive sodium intake contributes to cardiovascular disease. And just try avoiding sodium in your diet. It is the primary ingredient of table salt and is found in many processed foods. The finding that Americans are unaware of their sodium intake is problematic for policymakers because, on average, Americans consume 50 percent more than the daily maximum recommended level for sodium. Burtson has done research that shows education campaigns about the effects of excessive sodium intake work: Consumers – both hypertensive and non-hypertensive – will modify their purchase intentions if they are given this information, he says. But isn't the information out there? Sodium content is listed on Nutrition Facts panels on food labels, on some restaurant menus and within a growing body of education material. But are consumers paying attention? To find out, Burton teamed with fellow researchers from Wayne State University and Loyola Marymount to study two groups of consumers - one with high blood pressure and one normal blood pressure. When given the sodium information, the group with hypertension paid more attention to the information than those without hypertension. “While it is encouraging that hypertensive consumers pay some attention to sodium levels, it is worrisome that non-hypertensive consumers do not," said University of Arkansas marketing professor Elizabeth Howlett. "Because the effects of excessive sodium intake are cumulative, many who are not yet diagnosed as hypertensive are probably not paying attention to how much salt they consume." What's needed, the researchers say, is an effective education campaign that makes sodium content and its effect on the body more relevant for more consumers. They say their research shows that relevancy is the key - when consumers understand the harmful effects of too much sodium in the diet, they make different buying decisions when it comes to food. Children who snack on chips and other salty treats run the risk of developing high blood pressure, according to British researchers. Their study, reported in the Journal of Human Hypertension, found that most popular snacks contain higher sodium levels than those recommended by health experts. The study followed more than two thousand children between the ages of four and 18. The study monitored their salt consumption, but did not include salt added in cooked meals or at the table. According to the study, the average four-year-old consumed 4.7g of salt a day. Recommendations call for only 2-3g of salt per day in that age group. Whats wrong with salt consumption? The study found that each extra gram of salt consumed raised blood pressure significantly, leading to a higher risk of heart disease and stroke when they are adults. The children who consumed the most salt also had the highest blood pressure levels. Excessive salt consumption has also been linked to ailments such as asthma, osteoporosis, and stomach cancer, according to the report. Last July, two dozen leading hypertension experts, physicians, and health groups urged urging Secretary of Health and Human Services Mike Leavitt to swing his agency into action to reduce Americans' salt consumption. The high salt levels in countless processed foods and restaurant foods are a major factor in raising Americans' blood pressure, which in turn is a major contributor to heart disease and stroke. Blacks are disproportionately at risk for high blood pressure, the experts said. 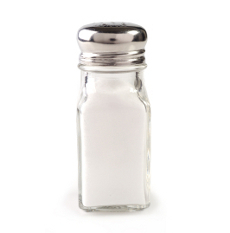 "There is virtual unanimity within the scientific community regarding the contribution of excessive sodium consumption to cardiovascular disease," the experts wrote, pointing to various government-funded recommendations, including those of the Dietary Guidelines for Americans, the Institute of Medicine, and the Seventh Report of the Joint National Committee on the Prevention, Detection, Evaluation, and Treatment of High Blood Pressure (JNC-7). Most Denny's meals are dangerously high in sodium, putting the restaurant chain's customers at greater risk of high blood pressure, heart attack and stroke, according to a class action lawsuit filed by a New Jersey man with the support of the Center for Science in the Public Interest (CSPI). The lawsuit seeks to compel the restaurant chain to disclose on menus the amount of sodium in each of its meals and to place a notice on its menus warning about high sodium levels. Guidelines from the Centers for Disease Control and Prevention (CDC) recommend that most people consume no more than 1,500 milligrams of sodium per day. But at Denny's, the great majority of its meals contain more, and in some cases, several times more. Some meals at Denny's provide more than 4,000 or 5,000 mg of sodium -- more than most adults should consume in three days. Diets high in sodium are a major cause of high blood pressure, which in turn is a major cause of heart disease and stroke, the first- and third-leading causes of death in the United States. "Denny's is slowly sickening its customers," said CSPI executive director Michael F. Jacobson. "For those Americans who should be most careful about limiting their sodium, such as people middle-aged and older, African-Americans, or people with existing high blood pressure, it's dangerous to eat at Denny's. Denny's customers deserve to be warned about the considerable health risk posed by many of these meals." The plaintiff, Nick DeBenedetto, is a 48-year-old resident of Tinton Falls, NJ, who has eaten for many years at Denny's restaurants in East Brunswick and Brick, NJ. He takes a prescription medication to control his high blood pressure and at home does not cook with salt or use the salt shaker. Some of his favorite Denny's items, such as Moons Over My Hammy or the Super Bird turkey sandwich, contain far more than 1,500 mg of sodium -- even without soup, salad, fried onion rings, or other side dishes. "I was astonished -- I mean, literally floored -- to find that these simple sandwiches have more salt than someone in my condition should have in a whole day," DeBenedetto said. "It's as if Denny's is stacking the deck against people like me. I never would have selected those items had I known." Moons Over My Hammy, a ham, egg, and cheese sandwich, has 2,580 mg of sodium by itself -- more than even a healthy young person should consume in a day. It's served with hash browns (adding 650 mg of sodium) or grits (an additional 840 mg). The Super Bird sandwich, served with regular French fries, has 2,610 mg of sodium -- more than twice what someone with high blood pressure should consume in a day. Denny's Meat Lover's Scramble, which has two eggs with chopped bacon, diced ham, crumbled sausage, Cheddar cheese, plus two bacon strips, two sausage links, hash browns, and two pancakes has 5,690 mg sodium, or 379 percent of the advised daily limit. A full meal at Denny's consisting of a bowl of clam chowder, a Spicy Buffalo Chicken Melt, and a side of seasoned fries contains an alarmingly high 6,700 mg of sodium. It's a big meal, to be sure, with about 1,700 calories. But that's more sodium than what 70 percent of Americans should consume in four and a half days. Even many of the smaller meals advertised for children and seniors have inappropriately high sodium levels. Many health experts consider high dietary sodium levels to be one of the nation's top health threats. Dr. Stephen Havas, adjunct professor of preventive medicine at Northwestern University's Feinberg School of Medicine, says that reducing the sodium content of packaged and restaurant foods by half would save at least 150,000 lives per year. For some people, particularly Denny's elderly patrons, getting several days' worth of sodium in a single meal might be enough to trigger congestive heart failure. "As a physician, I have grave concerns about the sodium levels at Denny's, and grave concerns about an elderly person or someone with hypertension eating even one such meal," Havas said. "The body can have a hard time getting rid of that much salt, potentially leading to fluid retention and accumulation in the lungs. Consuming that much sodium can have severe consequences." Denny's describes itself as the largest full-service family restaurant in the United States, with more than 1,500 restaurants and annual sales of $2.4 billion. "By concealing an important material fact about its products -- namely, that that these foods have disease-promoting levels of sodium -- Denny's is failing its responsibility to its customers and is in violation of the laws of New Jersey and several other states," said CSPI litigation director Steve Gardner. Denny's and CSPI had been in private negotiations over sodium, but those talks ended earlier this year. Shortly thereafter, the chain made small sodium reductions in a handful of items, like cheese sauce, shrimp skewers and kids' meals, but the chain did not make the kind of broad sodium reductions or menu disclosures urged by CSPI. The lawsuit filed against Denny's is CSPI's first sodium-related lawsuit against a food company. Separately, CSPI has petitioned the Food and Drug Administration (FDA) to regulate salt as a food additive and to restrict sodium levels in various categories of food. Cigarettes, scalding coffee, hot dogs: American consumers don't shy away from litigating fraudulent marketing or nondisclosure claims when the result is severe injury or health problems. The newest culprit, apparently, is sodium. In a class action lawsuit, a Chicago man accuses Denny's of putting consumers at risk by serving meals with dangerously high levels of sodium, and by failing to properly warn diners of the risk. Jason Ciszewski, a Denny's regular, says in his complaint that he now suffers from high blood pressure, requiring him to reduce his salt consumption and take prescription medication. According to Ciszewski's complaint, many of Denny's selections "contain more sodium than a human being should consume in 4 days." Ciszewski's attorneys charge Denny's with deceptive practices, alleging that the restaurant was not sufficiently forthcoming about the health risks presented by its food. The lawsuit also alleges unjust enrichment, breach of warranty, and breach of contract. Ciszewski is seeking $5 million in damages. Hypertension, a serious consequence of excessive sodium intake, is a hidden epidemic. One in three Americans has high blood pressure, a figure that health officials blame on high-sodium diets lacking in magnesium, calcium, and potassium. The average healthy young adult can take in 2,300 milligrams of sodium in a day; individuals over 40 should keep it to 1,500 milligrams. Those with hypertension are generally urged to further limit their intake, as sodium consumption matched with high blood pressure leads to a higher risk of heart disease or a stroke. Saying that Ciszewski's favorite dish exceeds the daily recommended limit would be an understatement. According to his complaint, Ciszewski is partial to the Meat Lover's Scramble, which Denny's online menu describes as, "Two eggs scrambled with bacon, diced ham and crumbled sausage, and topped with Cheddar cheese." In case you're still hungry, the omelet is served with two strips of bacon, two sausages, hash browns, and two pancakes. All in all, the gargantuan meal contains 5,600 milligrams of sodium, more than double the recommended intake for even the healthiest individuals. If that's not bad enough, the dish also boasts 1,960 calories and 112 grams of fat. Ciszewski was also a fan of the "SuperBird" turkey sandwich and "Moons Over My Hammy," which consists of ham, scrambled eggs, and two kinds of cheese, stuffed between sourdough bread slices and served with hash browns or grits. The dishes contain 2,600 and 3,200 milligrams of sodium, respectively. Lawsuits accusing restaurants of knowingly selling unhealthy food are hardly novel. In 2005, McDonald's settled a lawsuit alleging that the chain broke an earlier promise to reduce its use of trans fats, and failed to inform consumers. As part of the settlement, McDonald's was required to notify consumers that it was still using trans fats in its meals. In 2007, Burger King was slapped with a similar suit, which claimed that the fast food restaurant used partially hydrogenated oil despite the substance's link to heart disease. As America's obesity epidemic grows, some municipalities are taking matters into their own hands. In 2006, the New York City Board of Health voted to ban trans fats from restaurant food; Philadelphia followed suit the following year. New York went a step further in 2008, requiring all fast food chains to display caloric content on their menus. The regulation was enacted with the hope that diners will forgo a Big Mac when its 540 calories are staring them in the face. Even without legislative intervention, it is easier than ever for consumers to find the nutritional content of the foods they eat. Ciszewski's suit claims that Denny's nutrition-related disclosures are "indecipherable." However, Denny's online menu contains a prominently-placed "Nutrition/Allergens" link that leads visitors to a PDF file containing nutritional information for Denny's items. The chart includes total calories, grams of fat (including saturated and trans fats), cholesterol, and sodium for each menu item. Cisewzki's lawsuit follows a similar one filed by Nick DiBenedetto of New Jersey, who also claimed that Denny's meals contained much more sodium than the average person can ingest healthily, and that Denny's did not do enough to disclose the sodium levels in its meals. DiBenedetto's lawsuit is being supported by the Center for Science in the Public Interest (CSPI).